Steele Roberts, 2001. Excellent condition. 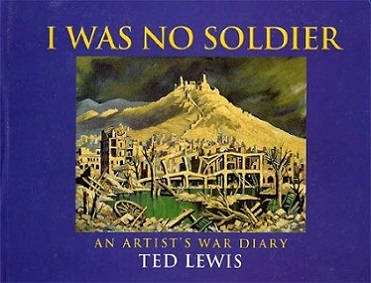 Art teacher Ted Lewis enlisted for war service in 1941, joining the medical corps. Whenever off duty he sketched and painted, often in dramatic and dangerous situations. His artistic talents were soon discovered and led to secondment as a mapmaker for General Freyberg. Ted's art and writing reflect his passion for classical cultures and capture the atmosphere of the Middle East and Italy under the shadow of war. His wry cartoons for the NZEF Times epitomize Kiwi humor and spirit, and helped preserve sanity in a fighting division. This diary was brought to light by Ted's former pupils. Its superb paintings, drawings and cartoons were complemented by poignant and powerful writing. Now, 60 years after the war, it is published for the first time. "...The ceasefire went into effect and suddenly the sounds of gunfire were no more. It was a tremendous silence and the most remarkable thing was that then we heard another sound, the throbbing song of hundreds of skylarks, hovering up there in a perfectly blue sky. They had probably been there all the time, but we could not hear them because of the harsh sounds of gunfire. This was a deeply emotional moment. I could not but think of the many young soldiers who would not hear this lovely song because they had forever entered the long silence of death, sustained even in the last hours of this offensive. The tragic waste of war - even the satisfaction of victory and the relief that the North African campaign was now over was tempered with the sadness of the awful cost."